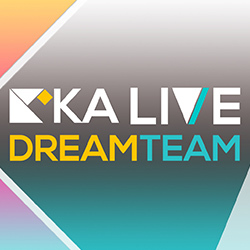 Once more Peak Performance Apps supports German television programme „KiKA LIVE Dreamteam“ with the development of a high-performance Online-Voting tool to determine the winners of each qualification round and the grand final. Erfurt/Leipzig 2018: The entertainment show „KiKA Live Dreamteam“ broadcasted on KiKA, a youth channel cooperation by broadcasters ARD and ZDF, returns with a new concept! Altogether 18 young people, divided into nine boys and girls, from Germany have the chance to prove their team qualities and knowledge of human nature in front of a large audience. A new feature of this year’s edition is that for the first time the candidates do not only have one week to get to know each other. Instead, there is a first week in which the candidates will spend time together at various locations. In the following second week, there are three qualification rounds and the grand final. In each qualification round three boys and girls play in pairs several games against each other. Only the players who prove that they are real team players will be able to collect as much points as possible. In contrast to last year’s edition, there is an important new feature: At the end of each qualification round, the TV audience decides which candidate pair will get a bonus of 55 points. The boy and the girl collecting the most points on the respective evening will become the daily winners and enter the grand final. In the final each of these winner teams compete to become the Dreamteam 2018 and get the chance to be involved in the conception of an episode of “KiKA LIVE”. Here, the TV audience decides again which candidate pair will get the bonus points and, therefore, has a massive impact on the results of an episode. In the period from 26th March 2018 until 29th March 2018, the TV audience again had the opportunity to vote for their favourites multiple times and be a part of the LIVE show via the already established Web-Application of the previous season, which was complemented with some new features. The TV audience could not only actively participate in the event but also contribute to the victory of their favourite team.